Many tasks in the workplace require the handling of hazardous materials that can be harmful to the eyes and face. Personal Protection Equipment (PPE) like safety goggles and safety glasses should be the first line of defense when working with these materials. But what if these safety precautions fail? Eyewash stations are emergency devices, required by OSHA, that give employees the ability to wash and flush their eyes quickly and efficiently if an eye injury should occur. Time is of the essence so it’s crucial to have emergency eyewash stations strategically placed to meet any relevant ANSI standards. 0SHA code 29 CFR 1910.151 requires that emergency eyewash stations be provided when workers are exposed to corrosive materials but it does not provide specific instruction regarding the installation and operation of such equipment. OSHA instead allows ANSI to establish the standard. As a result, the ANSI Z358.1-2009 standard has gained significant importance within the safety industry. By not complying with the ANSI standard, OSHA may elect to impose penalties from warnings and fines to plant shutdowns. The ANSI standard ANSI Z358.1-2009 is the recognized source of guidance to comply with OSHA 1910.151. For eyewash stations to be effective, ANSI recommends that the eyes be flushed immediately and thoroughly for at least 15 minutes using a supply of clean fluid under low pressure. Therefore, the most important step in treatment is getting to the eyewash or shower as quickly as possible and getting the affected area washed thoroughly before the chemical can cause further damage. Knowing these standards and the types of eyewash stations that are available will ultimately help you make a more informed buying decision. When choosing an eyewash station make sure it meets the ANSI Z358.1-2009 standard. Self Contained Eyewash Stations – These self contained units, also called portable eyewash stations, do not require plumbing and can be installed on any wall at little cost. They are the perfect solution for areas that do not offer an active plumbing system nearby. Most units feature an easy-to-use pull handle o that activates a steady stream of solution to flush the eyes. The design also keeps the users hands free, allowing them to hold open their eyes when in use. Plumbed Eyewash Stations – utilize a permanent connection to a water supply. According to ANSI regulations, they should be installed near hazardous areas and have an unobstructed path so that an injured person can access it within 10 seconds of having an eye injury. These units also give the user a hands free operation as well as an unlimited source of water. Can be used in conjunction with personal eye wash solution. Personal Eye Washes are supplementary devices that are made to support plumbed eyewash stations. They typically contain a mixture of a sterile phosphate buffering solution that quickly neutralizes acids and alkalis. Although these units do not meet official OSHA regulation, they are useful in situations where an injured person needs to be moved to an approved eyewash location. They usually contain enough solution to last for several minutes so they should be used in emergency situations only. They are essentially squeeze bottles of sterile solution used to flush the eyes if a critical eye injury should occur. Knowing how to use and position these units is an important first step in any first aid treatment involving the eyes. Employers should be aware of the ANSI regulations regarding the placement of these units. Identify all the areas which have potential eye hazards. Eyewashes should be within 100 feet from potential hazards. Draw maps and post them for a permanent reference. Make sure stations are identifiable with highly-visible signs. Eyewash stations should be located in areas free of obstructions. Be on the same floor as the hazard. Be protected from freezing and extreme heat. Be located near an emergency exits where possible. Be located in an area where further contamination can’t occur. Provide a drainage system for any excess water. Emergency eyewash stations should be located in any workplace, lab, or shop that utilizes toxic or hazardous chemicals or contains airborne particles. ANSI’s definition of “hazardous material” would include caustics, as well as additional substances and compounds that have the capability of producing adverse effects on the health and safety of humans. 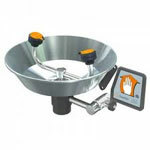 Maintaining a workplace eyewash station is also an important aspect of eye safety and first aid. Here are a few more safety and maintenance recommendations. Eyewash units must supply fluid to both eyes simultaneously. Record any maintenance performed on the unit. Eyewash solution must be disposed of by the expiration date. Water/Solution should be kept at temperatures near (60F – 95F). Plumbed eyewash stations should be tested monthly. Self-contained stations must be cleaned every six months. Have pure clean water in plumbed stations. Hands free operation in plumbed and portable stations. Stations must maintain a constant water/solution flow for 15 min. 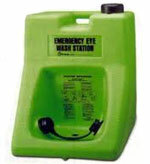 For a full copy of ANSI requirements for Safety Eyewash Stations visit ansi.org.